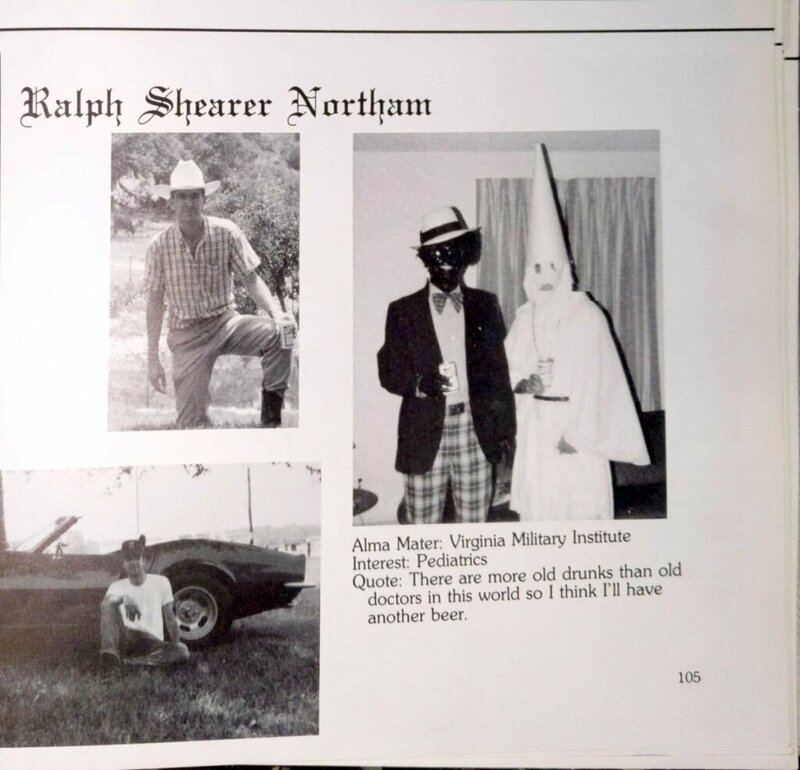 "I am not either of those people" in a racist yearbook photo, Ralph Northam (D) said, a reversal after his apology Friday for "the decision I made to appear" in the photo. RICHMOND, Va. — Virginia Gov. Ralph Northam (D) faced the public Saturday and defiantly said he will not resign because he does not believe that it is him in a racist photograph from his 1984 medical school yearbook. “I am not either of those people in that photo,” Northam told media gathered at the Executive Mansion, referring to the image of a person dressed in blackface and another in a Ku Klux Klan robe on his yearbook page. But he alluded to other actions in his past, and disclosed that in 1984 he won a dance contest in San Antonio where he wore dark shoe polish on his cheeks as part of a Michael Jackson costume. Northam said if he felt he wasn’t able to function efficiently as governor, he would re-visit the matter. His explanation runs counter to his public apology Friday, when he acknowledged that he appeared in what he called a “clearly racist” image. Northam said he selected three other photos that appear on the page but not the offensive image. He said he didn’t purchase the yearbook, and did not know the photo was on his page. “Pictures as close as that, I would have had to have chosen those. I can’t speak for Ralph, though,” said Broadnax, whose entry also included a favorite Langston Hughes poem. He doesn’t remember how the yearbook was created or even seeing it once it was published. Pamela Kopelove, who is credited in the yearbook as its editor, did not respond to repeated calls for comment. Northam was defying an avalanche of calls to step down from the office he’d assumed not 13 months ago. On Friday afternoon, the Republican Party of Virginia issued an early call for Northam’s resignation, followed by national Democrats, including a host of a 2020 contenders. Every group allied with the governor, from Planned Parenthood to the state Democratic party and Democratic leadership in the General Assembly urged Northam to leave office. A crucial group, the legislative Black Caucus, joined the chorus calling for his resignation after a tense meeting Friday night with Northam. Even home-state champions who regarded him as a dear friend — including immediate predecessor and patron Terry McAuliffe (D), himself a potential presidential candidate — said he had to go. By 9 a.m. friends who hoped he could weather the crisis were wondering if he could survive and avoid becoming the first Virginia governor to resign since the Civil War. “There’s no question the tide turned,” said one ally, who had been briefed by the governor’s senior staff and spoke on condition of anonymity because he was not authorized to disclose the private discussions. Northam and his inner circle had been preparing to fight as news of the photograph broke Friday afternoon – he issued a written apology, then a video mea culpa. They planned a “reconciliation tour,” taking him across the commonwealth to say he was sorry in person, his ally said. “Then everything changed between 6 and 9 p.m.,” the ally said, as national Democrats unleashed a torrent of calls for his resignation. On Friday, Northam, 59, released a statement and a video in which he admitted to appearing in the photo, although he did not say which costume he wore. As cable television devoted hours to the controversy and social media lit up with #ResignRalph hashtags and the drumbeat continued. Calls to resign also came from Democratic presidential hopefuls Sen. Elizabeth Warren (Mass. ), Sen. Kamala D. Harris (Calif.), Sen. Kirsten Gillibrand (N.Y.), Sen. Cory Booker (N.J.) and Julián Castro, a former mayor of San Antonio. If Northam were to resign, he would be succeeded by Lt. Gov. Justin Fairfax, who would serve the remaining years in Northam’s term and then be eligible to run for a full four-year term. Fairfax would hold the highest office in a state where his ancestors were once enslaved. An Ivy-educated lawyer, Fairfax carried a copy of the manumission papers of one of his ancestors in his suit pocket when he was sworn in as lieutenant governor. A Northam ally, Senate Minority Leader Richard L. Saslaw (D-Fairfax) initially defended the governor on Friday, saying that voters needed to weigh Northam’s lifetime of public service. But by Saturday afternoon, Saslaw, too, had joined the fray. Bob Holsworth, a veteran analyst of Virginia politics, said Northam would never have won the Democratic primary for governor against Tom Perriello had the photo surfaced during that 2017 race. Jim Morrison reported from Norfolk. Jenna Portnoy, Patricia Sullivan, Fenit Nirappil and Antonio Olivo in Washington contributed to this report. This is a developing story and it will be updated. Polar vortex takes toll on northern U.S.